Home / Our People / Faculty / Plant Soil Science and Agricultural Systems Faculty / Ruplal Choudhary, Ph.D.
Dr. Choudhary is a Food and Bioprocess Engineer with 20 years of academic and industrial experience in design and development of food processing equipment and operations. Before moving to SIU, he was a Postdoctoral Fellow at the University of Manitoba, and South Dakota State University. Dr. Choudhary also worked as a senior faculty member of Dairy Engineering Division at the National Dairy Research Institute Karnal, and as a Scientist at the Central Institute of Agricultural Engineering Bhopal, India. 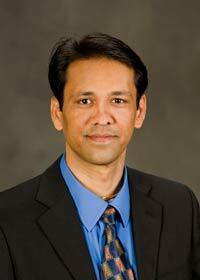 Dr. Choudhary is interested in improving safety and quality of foods such as dairy, soy and fruits and vegetables. The food safety research includes removal of microbial pathogens as well as mitigation of food allergy using the state of the art nonthermal processing technologies such as germicidal ultraviolet light, nonthermal plasma, power ultrasound and nanotechnology. Near infrared spectroscopy and color machine vision systems are used for rapid sensing of safety, quality and defects in food products. The other area of research interest is the process development for conversion of ligno-cellulosic biomass to biofuels, especially improving the enzymatic conversion of cellulose and hemicellulose to fermentable sugars for biofuel industry. Gautam, D., Umagiliyage, A. L., Dhital, R., Joshi, P., Watson, D. G., Fisher, D. J., & Choudhary, R. (2017). Nonthermal pasteurization of tender coconut water using a continuous flow coiled UV reactor. LWT-Food Science and Technology, 83, 127-131. Shlar, I., Droby, S., Choudhary, R., & Rodov, V. (2017). The mode of antimicrobial action of curcumin depends on the delivery system: monolithic nanoparticles vs. supramolecular inclusion complex. RSC Advances, 7(67), 42559-42569. Sarkar, P., Choudhary, R., Panigrahi, S., Syed, I., Sivapratha, S., & Dhumal, C. V. (2017). Nano-inspired systems in food technology and packaging. Environmental Chemistry Letters, 1-16. Dhital, R., Joshi, P., Becerra-Mora, N., Umagiliyage, A., Chai, T., Kohli, P., Choudhary, R. 2017. Integrity of Edible Nano-coatings and its Effects on Quality of Strawberries Subjected to Simulated In-transit Vibrations. LWT Food Science and Technology. 80: 257-264. Umagiliyage, A., Becerra-Mora, N., Kohli, P., Fisher, D.J., Choudhary, R. 2017. Antimicrobial Efficacy of Liposomes Containing D-limonene and its Effect on the Storage Life of Blueberries. Postharvest Biology and Technology. 128: 130-137. Hemis, M., Gariépy, Y., Choudhary, R., Raghavan, V. 2017. New Coupling Model of Microwave Assisted Hot-air Drying of a Capillary Porous Agricultural Product: Application on Soybeans and Canola Seeds. Applied Thermal Engineering. 114: 931-937. Hemis, M., Choudhary, R., Becerra-Mora, N., Kohli, P., Raghavan, V. 2016. Modelling of Microwave Assisted Hot-air Drying and Microstructural Study of Oilseeds. International Journal of Agricultural and Biological Engineering. 9(6): 167-177. Sarkar, P., Irshaan, S., Sivapratha, S., Choudhary, R. 2016. Nanotechnology in Food Processing and Packaging (Book Chapter). Nanoscience in Food and Agriculture 1: 185-227. Altemimi, A., Watson, D.G., Choudhary, R., Dasari, M.R., Lightfoot, D.A. 2016. Ultrasound Assisted Extraction of Phenolic Compounds from Peaches and Pumpkins. PloS One 11 (2), e0148758. Hemis M., Choudhary R., Gariépy Y., Raghavan VGS. 2015. Experiments and modelling of the microwave assisted convective drying of canola seeds. Biosystems Engineering. 139: 121-127. Umagiliyage AL., Choudhary R., Haddock J., Watson DG., Liang Y. 2015. Laboratory scale optimization of alkali pretreatment for improving enzymatic hydrolysis of sweet sorghum bagasse. Industrial Crops and Products. 74: 977-986. Makwana S., Choudhary R., Kohli P. 2015. Advances in Antimicrobial Food Packaging with Nanotechnology and Natural Antimicrobials. International Journal of Food Science and Nutrition Engineering 5 (4): 169-175. Dogra, Navneet; Choudhary, Ruplal; Kohli, Punit; Haddock, John ; Makwana, Sanjaysinh; Horev, Batia; Vinokur, Yakov; Droby, Samir; Rodov, Victor. 2015. Polydiacetylene Nanovesicles as Carriers of Natural Phenylpropanoids for Creating Antimicrobial Food-contact Surfaces. Journal of Agricultural and Food Chemistry. Accepted Article in Press. Makwana S., Choudhary R., Kohli P., Haddock J. 2015. In-vitro Antibacterial Activity of Plant Based Phenolic Compounds for Food Safety and Preservation. LWT Food Science and Technology. Accepted Article In Press. Altemimi A., Choudhary R., Watson D.G., Lightfoot D.A. 2014. Effects of ultrasonic treatments on the polyphenol and antioxidant content of spinach extracts. Ultrasonic Sonochemistry, DOI 10.1016/j.ultsonch.2014.10.023. Tammineedi CVRK, Choudhary R. 2014. Recent advances in processing for reducing dairy and food allergenicity. International Journal of Food and Nutrition Engineering. 4(2): 36-42. Makwana, S., Choudhary R., Dogra, N., Kohli P.and Haddock, J. 2014. Nanoencapsulation and immobilization of cinnamaldehyde for developing antimicrobial food packaging material. LWT Food Science and Technology. 57(2): 470-476. DOI 10.1016/j.lwt.2014.01.043. Tammineedi, K., Choudhary, R., Perez Alvarado G., Watson, D.G. 2013. Determining the effect of UV-C , high intensity ultrasound and nonthermal atmospheric plasma treatments on reducing the allergenicity of <alpha>-casein and whey proteins. LWT Food Science and Technology. 54(1) 35-41. Al-Hendi A., Choudhary R. 2013. Current Practices in Bread Packaging and Possibility of Improving Bread Shelf Life by Nanotechnology. International Journal of Food Science and Nutrition Engineering, DOI: 10.5923/j.food.20130304.02 pp. 55-60. Gürsoy S, Choudhary R., Watson D G. 2013. Microwave drying kinetics and quality characteristics of corn. Int J Agric & Biol Eng, 6(1): 1-10. Altemimi A., Choudhary R. 2013. Determination of antioxidant activity in different kinds of plants in vivo and vitro by using diverse technical methods. Journal of Nutrition and Food Sciences, 3(1): 184. doi:10.4172/2155-9600.1000184. Meziane, N., Bettahar, A., Choudhary, R., and Watson, D G. 2013. Measurement of granular flow in a vertical column using pulse induction (PI). Biosystems Engineering. 114(2):78-85. Hemis, M., Choudhary, R., Watson, D. 2012. A coupled mathematical model for simultaneous microwave and convective drying of wheat seeds. Accepted by Biosystems Engineering. Bandla S., Choudhary R., Watson D.G., Haddock J. 2012. UV-C treatment of soymilk in coiled tube UV reactors for inactivation of Escherichia coli W 1485 and Bacillus cereus endospores. LWT Food Science and Technology 46 (2012) 71-76. Nanyam Y, Choudhary R., Gupta L., Paliwal, J. 2012. A Decision-Fusion Strategy for Fruit Quality Inspection using Hyperspectral Imaging. Biosystems Engineering 111 (2012) 118-125. Liang Y., Tang T., Umagiliyage A.L., Siddaramu T., McCarroll M., Choudhary R. 2012. Utilization of sorghum bagasse hydrolysates for producing microbial lipids. Applied Energy 91(2012):451-458. Liang Y., Tang T., Siddaramu T., Choudhary R., Umagiliyage A.L. 2012. Lipid production from sweet sorghum bagasse through yeast fermentation. Renewable Energy 40 (2012): 130-136. Choudhary, R., Bandla S. 2012. Ultraviolet Pasteurizatio for Food Industry. International Journal of Food Science and Nutrition Engineering, 2(1): 12-15. Choudhary, R., Umagiliyage, A.L., Haddock, J. 2012. Aqua-ammonia pretreatment of corn stover for enhancing enzymatic saccharification. International Journal of Agricultural & Biological Engineering, 5(1): 43－48. Choudhary R., Bandla S., Haddock J., Watson D., Abughazaleh A., and Bhattacharya B. 2011. Performance of coiled tube ultraviolet reactors to inactivate Escherichia coli W1485 and Bacillus cereus endospores in raw cow milk and commercially processed skimmed cow milk. Journal of Food Engineering 107(1): 14-20. Bandla S., Choudhary R., Watson D., Haddock J. 2011. Impact of UV-C processing of raw cow milk treated in a continuous flow coiled tube ultraviolet reactor. CIGR Journal. Choudhary R., T.J. Bowser, P. Weckler, N.O. Maness, and W. McGlynn. 2009. Rapid estimation of lycopene concentration in watermelon and tomato puree by fiber optic visible reflectance spectroscopy. Postharvest Biology and Technology. 52: 103-109. Choudhary R., J. Paliwal, and D.S. Jayas. 2008. Classification of cereal grains using wavelet, morphological, colour, and textural features of non-touching kernel images. Biosystems Engineering. 99(3) 330-337. Choudhary R. 2006. Bio-imaging and sensing applications in food and dairy processing industries. Beverage and Food World. 33(3):42-47. Sarkar P., Choudhary R. 2014. Chapter 4. UV Imaging. In: Imaging with Electromagnetic Spectrum, applications in food and agriculture. Manickavasagan and Jayasuriya (eds.). Springer-Verlag, Heidelberg 2014. Choudhary, R., Alan S. Walters. 2012. Tomato Antioxidant Content as Influenced by Conventional and Organic Production Methods and Post Harvest Management. In Tomatoes: Cultivation, Varieties and Nutrition. Nova Science Publishers, Inc.